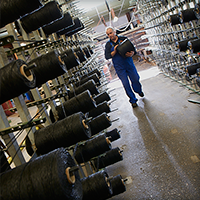 We make the maximum effort to guarantee the safety of our fibre rope products. Quality certification and extensive test facilities provide assurance that all products and processes comply with the strictest of safety standards. Van der Lee's quality management system was approved by Lloyd’s Register Quality Assurance and complies entirely with ISO 9001: 2015 standards. Please see our certification here. All our incoming raw materials, semi-finished products and commodities are inspected for conformity. All goods to be shipped are also subjected to an exit inspection. These inspections assure constant and consistent quality.